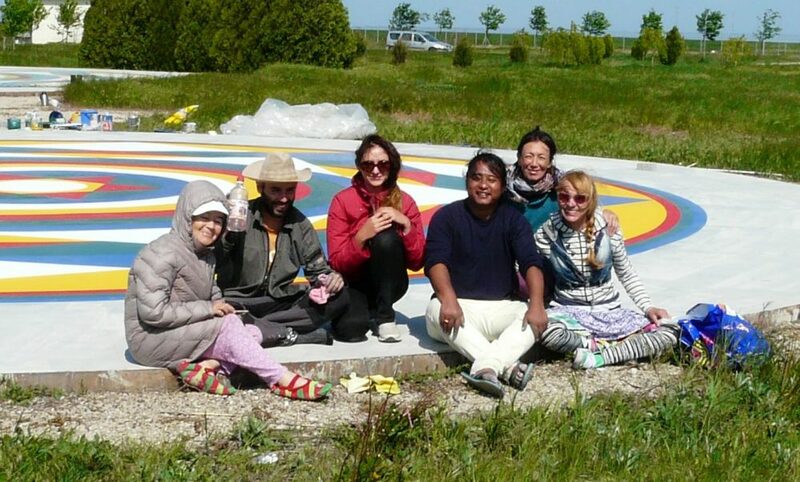 On 17th May 2017, at Merigar East, Romania, Migmar Tsering set a new International Dzogchen Community world record by painting two solar Vajra Dance Mandalas in 5 days. Migmar was helped by Tamara Khamdamova , Sholpan Temirkhanova (Russia), Dessi, Violet (Bulgaria), Gabriella Schneider (Germany), Iuliana, Karina, Veronica, Alexandru and our dear geko Mihai (Romania). As we send you this joyous news, our hands are still painted in the colors of the five elements. From now on, Merigar East welcomes dakinis and dakas on three Vajra Dance mandalas for practicing this precious Upadesha of our dearest Master. With best wishes from Merigar East!